Expert witnesses provide a valuable societal service – interpreting evidence that is oftentimes complex or evidence that may be easily overlooked, misunderstood or misinterpreted if outside of the knowledge, experience or field of work of others. The interest of the public and the restaurant, bar, and food service industry are best served when unbiased restaurant expert witness analyses, opinions, reports, and testimony are readily available to both Plaintiffs & Defendants. Howard Cannon is a credible expert witness who will work diligently to evaluate a case without bias and, as an experienced expert witness, has established procedures for removing language from reports and testimony that may inappropriately favor one side of the dispute over the other. Howard only serves as an expert witness in litigation matters where issues appropriate to his training and expertise are involved to be sure that justice is done to both Plaintiffs & Defendants. He understands that his overriding duty as an expert witness is to provide independent, impartial, and unbiased opinions to the court — this is a position which Mr. Cannon takes extremely seriously. Restaurant Expert Witness – Howard Cannon provides a completely unbiased approach to each and every case, regardless of whether he is contacted by the attorney for the Plaintiff or the attorney who represents the Defendant; and, as a consequence, is better able to assist those seeking the expertise of an expert witness and making effective use of his special knowledge and experience. Thus, Restaurant Expert Witness – Howard Cannon is better able to meet the court’s needs, and the attorneys can better serve their clients and the interests of justice. Ultimately, this unbiased approach enhances the quality of the expert opinions expressed by Mr. Cannon and will greatly reduce the time and stress (and many times, the expense) for all of those involved. 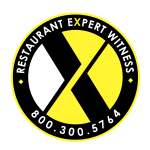 Call today for a FREE, no-obligation initial consultation with Restaurant Expert Witness – Howard Cannon: 800.300.5764 or Email Us.